More information is needed on the effects of silvicultural treatments and forest canopy structure on microclimate and plant species regeneration in northern forest ecosystems. Our objective is to gain an understanding of the influence of forest canopies on the understory and overstory microclimate on selected northern forest ecosystems and to assess the effects of microclimate on plant species regeneration and early stages of forest succession. Research will be conducted at the Willow Springs Ecosystem Processes Site within the footprint of the existing Ameriflux tower on the Chequamegon/Nicolet National Forest near Park Falls, WI. Environmental monitoring is being conducted in natural forests and in manipulated forest canopies with standard monitoring stations. Monitoring is on a year-round basis using Campbell CR-10 dataloggers. Vegetative surveys of woody and herbaceous plants on the sites are conducted periodically and canopy leaf area index (LAI) is estimated using sunfleck ceptometer methods. Our group also provides local technical and scientific support for CHEAS scientists working on the Ameriflux tall tower and associated flux towers, and is the primary USDA Forest Service contact for the team. 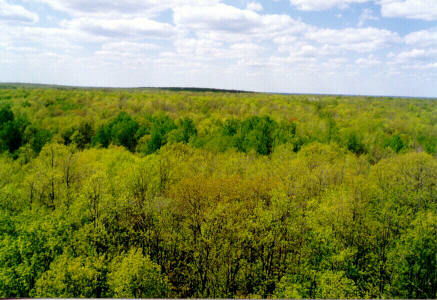 -Gain an understanding of the influence of the forest canopy on microclimate of forest sites. -Assess the effects of microclimate on forest plant species regeneration and early stages of forest succession (e.g., effects of frost on seedling development. The Willow Springs Ecosystem Processes Site is located on the Park Falls district of the Chequamegon/Nicolet National Forest in northern Wisconsin, (45 degrees 47 minutes N. Lat., 90 degrees 3 minutes W. Long.) 50 km southeast of Park Falls, WI. Meteorological conditions are being monitored at three monitoring stations. Each station is located in the center of a 8 hectare (20acre) block of unique overstory conditions, including a clearcut, a shelterwood with an overstory canopy density of 50% crown cover, and a control. The stations were deployed in 1993 and have been operational since. The clearcut and shelterwood blocks have experienced significant overstory and understory development since the 1988 logging operation. This development has been documented with regeneration, total vegetation surveys, and periodic leaf area index measurements. In addition to the aforementioned measurements, total solar radiation is measured in the clearcut and net radiation is measured with a roving sensor that is rotated to each block during the year. Soil water content is also monitored at the control station with time domain reflectometry technology. Soil water content is recorded every three hours at three locations at depths from the surface to 30 cm, and 50 to 80 cm. The above measurements have been documented on a continuous basis since 1994 with the exception of the soil water content measurements which began in 1996 and will be continuing in 1998. The 50% crown cover block will be thinned to a density of 25 trees per hectare (10 trees per acre) in the winter of 1998-1999. This harvest (Dec. 1998) will provide opportunities for some selective measurements achieved through destructive harvesting. Interest in participation in such activities must be scheduled with us before the summer of 1998. Leaf area index measurements will be made in conjunction with the Gower and Bolstad teams. North Central Research Station in Rhinelander, WI provides local on-site support for several CHEAS research activities: 1) Support at the WLEF tower includes general maintenance and forwarding of raw data from a LiCor CO2 analyzing system and a gas chromatograph, 2) Support for a NCAR radarbased system that characterizes CO2 boundary layer development near the WLEF tower. Weather balloon deployments will also be conducted during 1998 at the radar site, and 3) Support at the Willow Creek Flux tower will consist of routine maintenance of a Campbell data logger system including verification that system is operating according to protocol, forwarding of data sets and maintenance of AC power generator. Our research is a cooperative venture with W.E. Heilman of the North Central Research Station in East Lansing, MI and K.J. Davis of the University of Minnesota. Davis, K.J., P.S. Bakwin, C. Zhao, W.M. Angevine, D.F. Hurst, and J.G. Isebrands, 1996. Monitoring regional forest-atmosphere exchanges of carbon dioxide. In: Proc. American Meteorological Society 76th Annual Meeting, January 1996. Atlanta, GA. pp. 302-305. Heilman, W.E. and J.C. Zasada, 1998. Modeling the atmospheric dynamics within and above vegetation layers. In: Proc. of the Seventh Symposium on Systems Analysis in Forest Research, Traverse City, MI. (Accepted). Heilman, W.E., J.C. Zasada, R.M. Teclaw, and D.S. Buckley, 1996. Harvesting effects on the microclimate of northern hardwood forests in the upper Great Lakes region. In: Proc. of the 22nd Conference on Agricultural and Forest Meteorology, Atlanta, GA. pp. 397-400. Hurst, D.F., P.S. Bakwin, C. Zhao, K.J. Davis, and R.M. Teclaw, 1996. Landscape-scale surface fluxes of methane and hydrogen in a North American boreal lowland and wetland forest. In: Proc. AGU Fall Meeting, EOS Trans. A.G.U., 77(46), F124-125. Isebrands, J.G., S.L. Steele, and J. Van Cleve, 1995. Photosynthetically active radiation. In: Cline, S.P. (ed). Environmental monitoring and assessment program: Forest Health Monitoring: Quality assurance project plan for detection monitoring project. Washington, D.C. U.S. Environmental Protection Agency, Office of Research and Development: Sec. 5.4, 1-14. Teclaw, R.M. and J.G. Isebrands, 1991. Artificial regeneration of northern red oak in the Lake States. In: Laursen, S.B. and J.F. DeBoe (eds). The oak resource in the upper midwest: implications for management. June 3-6, 1991. Winona, MN. Pp. 187-197. The USDA Forest Service=s Northern Global Change Research Program has provided funding for quantifying the effects of disturbance on forest succession and microclimate in the upper Great Lakes region. As part of this overall research effort, this study proposes to improve our understanding of models of the effects of canopy cover on forest microclimates. Long-term monitoring of subcanopy atmospheric temperature, humidity, wind, net radiation, photosynthetically-active-radiation, precipitation, and soil temperatures, provides data usable for analysis of the variations forest canopy cover produces in these quantities. Conditions are monitored on three sites; one regenerating clearcut, one control plot, and one where overstory was reduced by 50%. Analysis involves basic statistical techniques and complex meteorological models. Where and when possible, the physical processes responsible for differences in microclimate will be determined. -Provide a detailed multi-year data set of meteorological variables appropriate for studies of forest microclimate under different canopy covers. -Assess the effects of forest canopy manipulation on the microclimate of northern forest ecosystems in the northern Great Lakes region. -Assess the effects of different forest overstory conditions on disturbance occurrence in northern forest ecosystems in the northern Great Lakes region. -Develop models to predict microclimatic conditions and associated plant growth in a changing environment. The field site for this study at the Willow Springs Ecosystem Processes Site is on the Chequamegon/Nicolet National Forest, 50 km from Park Falls, Wisconsin. In 1988 the study site was divided into 8 ha sections; one was left uncut, one had half of the overstory removed, and the third was clearcut. The plots are on level to gently-sloping terrain, with moderately well-drained sandy loam soil and a canopy height of ca. 20 m. Tree species dominant on the wooded sites include white ash, sugar maple, basswood, and red oak. During the summer of 1993, we erected a 10 m tower in each of the three study plots, with instruments to measure and record atmospheric conditions. The instruments record hourly-average values of temperature, relative humidity, wind speed, wind direction, and photosynthetically active radiation (PAR) at 2.5 and 10 m above the ground. In addition, three 2 m tall stakes in each plot are equipped with thermocouples to measure air temperature at 0.25, 0.5, 0.75, and 1.0 m. Each plot also has one rain gauge. Thermocouples at 0.05, 0.10, 0.20, 0.50, and 1.0 m measure soil temperatures in three pits on each site. We are analyzing data on a continuing basis as needed for specific studies. We are producing climatological summaries and a meteorological data archives on a continuing basis. As there is no anticipated termination of the data collection, there is no planned date to have all summaries and modeling studies complete. -Yearly comprehensive observational and modeling data bases for the Willow Springs Ecosystem Processes Site, including hourly temperatures, relative humidities, wind speeds, wind directions, net radiation, photosynthetically-active-radiation, and soil temperatures. -Yearly climatological summaries of within-canopy conditions at the Willow Springs study site. We have used air and soil data in a boundary-layer turbulence model (Heilman and Dobosy 1985; Heilman and Takle 1991)to simulate nocturnal mean and turbulence characteristics in the lower inversion layer during frost episodes at the site. These simulations showed the importance of forest overstory densities in affecting frost occurrence at the surface. We have been using the air and soil temperature, wind, and humidity data collected in 1994 and 1995 in model simulations of nocturnal cooling on calm nights. The model used for this study is a radiative transfer model (Potter 1998) with limited microphysics (condensation and evaporation). The purpose of these simulations is to better understand the physical processes that dominate under conditions conducive to early growing-season frost episodes before the trees have flushed. Heilman, W. E., and R. Dobosy. 1985. A nocturnal atmospheric drainage flow simulation investigating the application of one-dimensional modeling and current turbulence schemes. J. Climate Appl. Meteor. 24:924-936. Heilman, W. E., and E. S. Takle. 1991. Numerical simulation of the nocturnal turbulence characteristics over Rattlesnake Mountain. J. Appl. Meteor. 30:1106-1116. Heilman, W. E., J. C. Zasada, R. M. Teclaw, and D. S. Buckley. 1996. Harvesting effects on the microclimate of northern hardwood forests in the upper Great Lakes region. In: Proceedings of the 22nd Conference on Agricultural and Forest Meteorology, Atlanta, GA. pp. 397-400. Heilman, W. E., and J. C. Zasada. 1998. Modeling the atmospheric dynamics within and above vegetation layers. In: Proceedings of the Seventh Symposium on Systems Analysis in Forest Research, Traverse City, MI. (Accepted). Potter, B. E. 1998. Passive frost-risk reduction for forest management in northern hardwoods. In: Proceedings of the Seventh Symposium on Systems Analysis in Forest Research, Traverse City, MI. (Accepted). Since 1994, atmospheric scientists have been examining the near-surface atmospheric conditions under different types of forest overstory coverage at the Willow Springs Ecosystem Processes Study Site on the Chequamegon/Nicolet National Forest. Because of the limited heights (10 m) of the meteorological towers at the Willow Springs site, forest-atmosphere interactions above the canopy layer at the site cannot be examined. The erection of the 30 m Willow Creek flux tower on the Chequamegon/Nicolet National Forest offers an opportunity to examine not only the atmospheric-boundary-layer dynamics within a vegetation layer, but also the atmosphere-forest interactions at levels above the forest overstory. As part of this proposed study, the Willow Creek flux tower will be instrumented with temperature, wind speed, wind direction, relative humidity, net radiation, and photosynthetically-active-radiation probes to provide a comprehensive data base of atmospheric conditions within and above the vegetation layer at the site. The data base will provide the foundation for observational analyses and boundary-layer modeling work to assess a variety of forest-atmosphere interactions within and above vegetation layers, including the development and evolution of nocturnal inversion layers, frost occurrence in this type of environment, radiational processes within vegetation layers, and the diurnal evolution of atmospheric turbulence characteristics. -Develop a comprehensive observational and modeling data base of atmospheric boundary-layer conditions within and above a vegetation layer at the Willow Creek flux tower site that can be distributed for use by the scientific community. -Provide a better understanding of the atmospheric boundary-layer dynamics within and above vegetation layers. -Provide a better understanding of the development and evolution of nocturnal inversion layers within and above vegetation layers. -Assess the forest-atmosphere interactions that influence the development of frost episodes within vegetation layers. -Provide a better understanding of the role of atmospheric boundary-layer turbulence in affecting the atmospheric environment within and above vegetation layers. Atmospheric boundary-layer and soil measurements will be made at the Willow Creek flux tower located on the Park Falls District of the Chequamegon/Nicolet National Forest, 37 km from Park Falls, WI. In 1998, the Willow Creek flux tower will be instrumented with a variety of probes to provide profile information for temperature, wind speed, wind direction, relative humidity, photosynthetically-active-radiation, and net radiation. Temperature and relative humidity measurements will be made at five levels: 3 m above the surface, just below the canopy crown, within the canopy crown layer, just above the canopy crown, and at the tower top (30 m). Wind speed and direction will be measured at 3 levels: 2 m above the surface, just below the canopy crown, and just above the canopy top. Photosynthetically-active- radiation and net radiation will be measured at 2 levels: 2 m above the surface and just above the canopy top. Near surface and below-ground temperatures will be made near the tower site at the following levels (2 m, 1 m, 0.75 m, 0.5 m, 0.25 m, surface, -0.05 m, -0.1 m, -0.2 m, -0.5 m, and -1.0 m). Soil moisture will also be measured near the tower site at depths of -0.05 m, -0.5 m, and -1.0 m.
Atmospheric measurements will be made continuously, 24 hours a day, 365 days a year. At a minimum, atmospheric measurements will be reported each hour based on averages computed from a set number (to-be-determined) of observations within that hour. Data from the atmospheric and soil probes will be sent to an on-site datalogger and then transferred to portable media (e.g. JAZ Disks, CD-ROMs) for archiving. The Willow Creek flux tower will be erected during the late winter or early spring of 1998, with instrumentation of the tower to follow in the spring of 1998. Testing of the instrumentation and the development of appropriate measurement protocols will be established during the spring months of 1998. This will ensure that measurements from this study can be effectively integrated with concurrent eddy flux measurements carried out in concurrent studies. Measurements will then continue throughout the remaining months of 1998 and for at least two more years (through 2000). Quality assurance and quality control activities for the observational data collected each year for the duration of the project will be carried out during the months of January-April for data collected in the previous year. Quality-controlled data for each year will be archived according to established protocols and made available in the latter months of the following year. Preliminary analyses of the observational boundary-layer data will commence during the fall of 1998. These analyses will focus on diurnal temperature, humidity, and wind speed trends at the different measurement levels on the tower. Analyses of the data will continue in following years to address. -Yearly comprehensive observational and modeling data bases including hourly (at a minimum) temperatures, relative humidities, wind speeds, wind directions, net radiation, photosynthetically-active-radiation, soil temperatures, and soil moisture available on CD-ROM. -Yearly climatological overviews of within- and above-canopy conditions at the Willow Creek flux tower site. In conjunction with the analyses of the observational data, boundary-layer model (Heilman and Dobosy 1985; Heilman and Takle 1991) and radiational model (Potter 1998) simulations will be carried out to further examine the fundamental diurnal turbulence structure (turbulent kinetic energy, turbulence anisotropy, turbulent heat and moisture fluxes, momentum fluxes, turbulent diffusion) and radiational processes that characterize vegetation layers. Observational data collected at the flux tower site will provide crucial boundary and initial conditions for the modeling effort along with model verification information. 1407 S. Harrison Rd., East Lansing, MI.